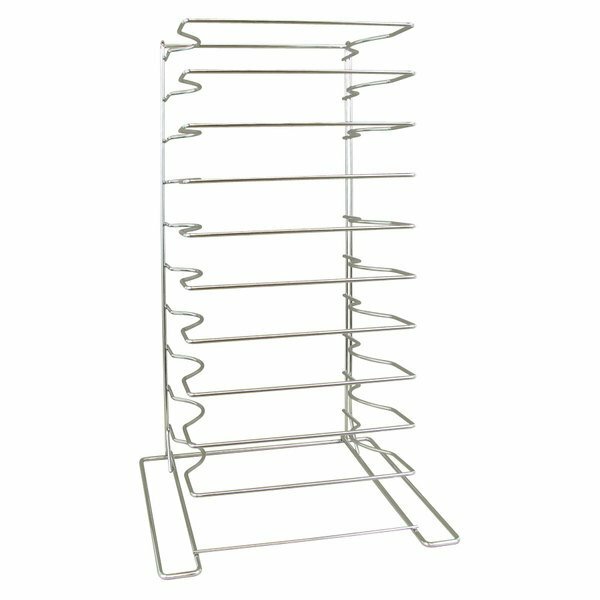 This American Metalcraft 19033 10 slot pizza rack has a 16" square base and is made of heavy-duty, chrome-plated steel rods and each shelf can hold up to 6 lb. This pizza rack will accommodate pizza trays, screens, separators, etc., from 16" through 23" in diameter and up to 2 1/4" deep. This pizza rack ships pre-assembled. These pizza pan racks are a great asset to the kitchen. Well made, very sturdy with ample space for ease of pizza pie pans as described. We love this product. We stage our baking trays (12x18) loaded with flatbread dough for a final rest before placing into the oven. The rack is sturdy and frees up precious work table space in our bakery. We use this rack in our school foodservice operation. We cook 10-20 pizzas every Friday, and this rack really comes in handy. Easy to move and can hold 10 pizzas at once. Great buy! this pizza pan rack holds many pizzas perfectly .the rack is very durable and stylish. I like the stainless steel finish and quality of the metal. These are the cadillac of pizza racks. I bought the cheaper ones also and they break. The real Metal craft ones will last for years. Got this to keep track of finished tickets as they leave the kitchen. We are now able to easily find misplaced orders, review our ticket times through the heaviest part of our service, and reduce clutter. Solid construction.